How does my community get there? Build resilience. I have skills I can use in a disaster to help others. If something unpredictable were to happen, I can count on my community. My community is not immune to disasters. For more information, please visit www.rand.org/resilience-in-action.html. 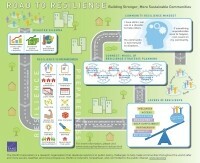 Chandra, Anita, Joie D. Acosta, Stefanie Howard, Lori Uscher-Pines, Malcolm V. Williams, Douglas Yeung, Jeffrey Garnett, and Lisa S. Meredith, Road to Resilience: Building Stronger, More Sustainable Communities. Santa Monica, CA: RAND Corporation, 2013. https://www.rand.org/pubs/infographics/IG114.html.